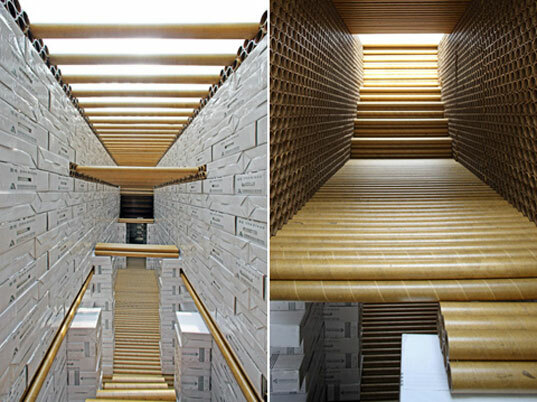 With a structural system reminiscent of Shigeru Ban’s Paper Church, Architect Li Xianggang‘s Paper-Brick House showcasing at this year’s annual Architecture Biennale in Venice, Italy is a mesmerizing paper fortress. Composed of paper tubes, paper boxes, and adhesive tape (and some metal connections), the materials work together to mimic a brick house. And something about it makes me nostalgic for the cardboard forts of my youth which only required an empty basement, a lot of boxes, and my imagination fully intact. The theme for this year’s Chinese pavilion was ‘ordinary architecture’, and the way the Paper-Brick house dealt with the theme was heavily influenced by the catastrophic Sichuan earthquake earlier this year. It points out that rapid urban development in China led to buildings and homes of inferior quality, which played a role in thousands of lives lost in the earthquake- and asks how architects can respond to such circumstances. Although the Paper-House does not necessarily offer an answer, it does prove that careful construction goes a long way, even with an unusual materials list. The house is meant to be a fully-functioning home where people can live, play, and build a sense of community. The floor plan of the house also responds to Chinese culture as it includes an interior courtyard, found in traditional Chinese buildings. Ultimately, Xianggang hopes that the Paper-House emphasizes the importance of sound construction. In a world where new developments seem to pop up daily, quality should not be forgotten. Although it is unlikely we will see paper-house villages in the future, the message is worth considering, and the house itself is definitely worth a visit if you are in the area. @livewithless Says, Is your comment directed at the builder/designer of this paper structure or toward the person who posted this article on inhabitat.com? Because the builder/designer was making a point about sound construction and unusual materials, not "sustainable architecture"... Dunder Mifflin would be proud of this fortress! I do not understand how this is related to sustainable architecture in any way. The point about careful construction doesn't justify the use of such massive amount of fresh paper to construct a building. I believe it sends a wrong message to many who will not get the fine point (or excuses) for this wasteful project. With a structural system reminiscent of Shigeru Ban’s Paper Church, Architect Li Xianggang's Paper-Brick House showcasing at this year’s annual Architecture Biennale in Venice, Italy is a mesmerizing paper fortress. 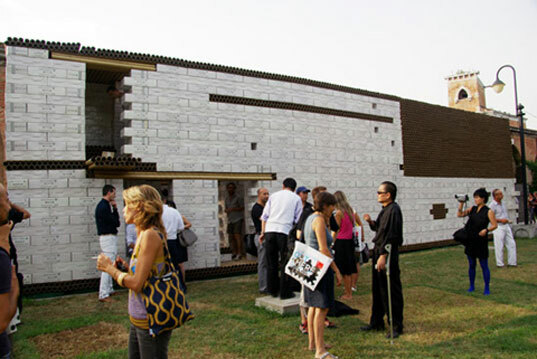 Composed of paper tubes, paper boxes, and adhesive tape (and some metal connections), the materials work together to mimic a brick house. And something about it makes me nostalgic for the cardboard forts of my youth which only required an empty basement, a lot of boxes, and my imagination fully intact.